Our automatic content protection system has detected that your sound “01 FRESCO KANE” may contain the following copyright content: “Fresco Kane (Explicit)” by Fresco Kane, owned by Epic. As a result, its publication on your profile has been blocked. Back in 1992, Jermaine Dupri (or JD to many) brought Kris Kross to the nation’s attention by producing the hit song that made us Jump. He went on to have his own successful rapping career, which included throwing rhymes with Jay-Z, Lil’ Kim, and more as the youngest producer with a number one record. He is also the former president of Virgin Records. He explains what he is seeing in the music industry, technology, social networking, and where he sees things going in his talk below. You can also attend Tech Cocktail Week the second week of every month in downtown Las Vegas to hear from thought leaders, enterpreneurs, and startup founders from around the country. Some legendary concerts and panels went down at this year’s Canadian Music Week, but the festivities also spilled over to the club, as hip-hop legend Jermaine Dupri hit up Cinema as a guest DJ last Saturday night. Walking into the relatively new club located in Toronto’s upscale Liberty Village, it would have been hard to believe that the renowned JD would be in the building as the first few hours, the warm-up DJ spun electronic and top 40 tracks. It seemed to be a high class, high-heeled affair, where private bottle popping celebrations were happening in all the small booths around the parameter of the dark club. One group went as big as to pop the top on a Texas Mickey of Grey Goose, quite evidentially enjoying itself. It was so crowded that it was hard to even dance to the bangers the ATL CEO spun. By 1 a.m., the venue was packed and the dance floor was full of intoxicated patrons waving neon flashing glow sticks, having the time of their lives. Just then, a bald shiny head that could barely be seen over the top of the DJ booth appeared, which one could only assume was Mr. Dupri. He threw on Rihanna’s “Pour It Up” and stood up with his arms in the air as the crowd screamed. Cinema became a zoo as the females made their way close to the DJ stand, the camera flashes adding to the light show from the electric neon booth. It was so crowded that it was hard to even dance to the bangers the ATL CEO spun. Not that the tracks were anything spectacular, as JD played the same recent club hits that can be heard during any local clubbing night out such as, Juicy J’s “Bandz A Make Her Dance” and Chief Keef’s “I Don’t Like”. For such a legend, it would have been nice to hear the classic hits from his glory days in addition to the one or two Hov tracks he actually did spin. Those in attendance didn’t seem to mind at all though, as they danced into the early morning. David Deal: Why are you speaking at events like Startup Grind? Jermaine Dupri: I am bridging the gap between music and technology. Technology has completely upended the music industry over the past decade. And music is clearly shaping the future of the technology world. Just look at the recent news about Google striking a deal with Warner Music Group to offer subscription services through Google Play and YouTube. But you don’t see enough music executives at technology events to embrace the disruption. And you don’t see enough technology leaders as music events. I am CEO of both So So Def Recordings and the Global 14 social media site that I founded. I am in an unusual position to create a convergence for music and technology. David Deal: What’s your message to startups? Jermaine Dupri: Social media technology levels the playing field for startups and entrepreneurs. Social media technology is free, accessible, and gives anyone a chance to create a brand. For example, Global 14 is a home for young entrepreneurs and musicians with vision to share their ideas. I launched Global 14 in 2011 as a community for people to support each other. We now have 44,000 members. David Deal: How has Global 14 been a launching pad for fresh ideas? Jermaine Dupri: Let me tell you about a Global 14 member named Sharon Simmons. She created an app called “I Got ‘em,” which helps citizens fight crime by giving people an easy way to use their mobile devices to report crimes to law enforcement officials. I have seen ideas nowhere good as this one receive full financial backing. “I Got ‘em” deserves attention — it’s the kind of creation that comes from a community of creators. So I’ve been using Global 14 as a platform to raise awareness for her idea. Global 14 members have launched more than 1,000 communities on topics such as running a business. Google has emulated the Global 14 model by launching communities on Google Plus. Global 14 members created the Global 14 Radio brand, which is a popular digital radio talk show. My role is to provide a platform for ideas on Global 14 and let the world know about them. Not everyone has the money to attend an event like Startup Grind. I aspire to elevate ideas bubbling up from the streets. David Deal: What can startups learn from Jermaine Dupri? Jermaine Dupri: I think my story resonates because I provide a different perspective to start-ups. Instead of talking about starting up, I talk about starting over. I created a business from scratch, So So Def Recordings in 1993, when I was 21 years old. Then in 2011 I blew up the So So Def Recordings website and launched my own social media community, Global 14. My lesson to startups is to be willing to disrupt your own model for success. David Deal: You’ve often stated that personal style and having a sense of swagger are important to you. Why are swagger and style important to startups? Jermaine Dupri: When you are starting out with little capital and no proven success, your personal style and swagger are all you have. You need swag to make a mark. David Deal: What have you learned from hanging around startups? 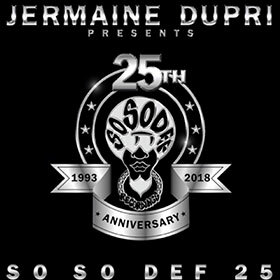 Jermaine Dupri: Never get comfortable. There’s always a new idea around the corner to disrupt your world.